Are You Ready For Reading Workshop? Hi Again! We are taking advantage of our hurricane lockdown in NYC to get a jump start on this week’s post: Reading Routines and Charts, that will help set children up for the first few weeks of a reading workshop. Depending on your students’ familiarity with workshop structure, you may find you need all or none of these charts. So you know, these ‘start of the year’ charts are usually small and will probably come down or be revised before the end of the month. These are nuts and bolts charts that deal more with behaviors and expectations than the actual teaching of reading. We will get more into strategy charts in the next week or two! 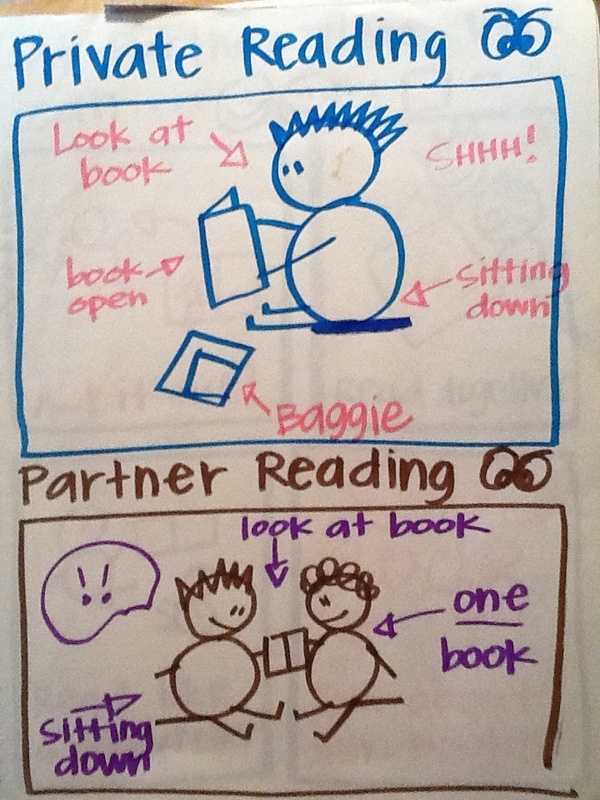 A chart that illustrates what reading on my own and reading with a partner looks like. 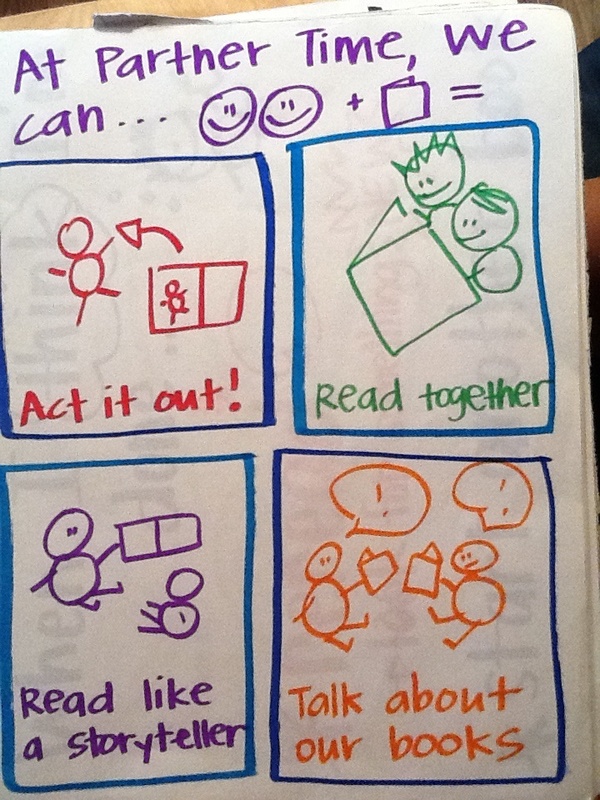 This chart illustrates two ways readers can interact with books during the reading workshop. The first part illustrates what a reader does when reading by himself, what we often call “private” (or independent) reading time with books. The second portion of the chart shows how readers position themselves to read together during partner time. Notice the annotations and arrows that point out expected behaviors like, sitting down, looking at the book, reading and talking quietly. Taking photos of actual students in the act of reading by themselves and reading with partners can be even more powerful. It is nice to take the photos, then discuss with the students what they notice about private and partner reading time. You can then mark the photos up with the students’ key noticings about private time vs. partner time. As you know, everything takes about 5 minutes within the first week of school, so you have the luxary of time to study the two photos, mark the differences, and then spend some time acting out the desired behaviors with your class. This could EASILY be done on a smart board, or even with videos, as well. If you do this with photos or video, SEND IT IN, so we can show the real deal in real time. 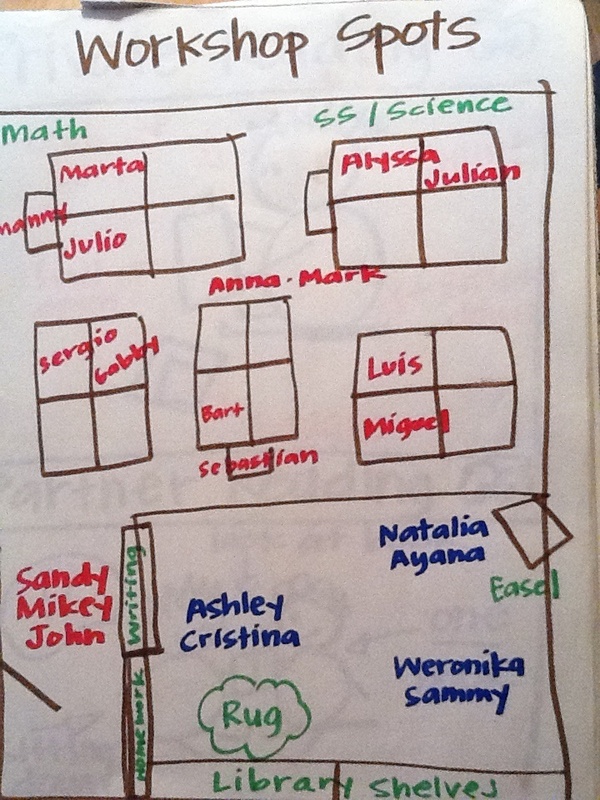 This is a map to show where everyone sits during reading time. This chart is a record of where everyone sits during reading workshop. Kids, like people, work best in different spots depending on preferences and personality. After a bit of time trying out spots, you might make a map (notice the connection to social studies!) so children remember where to head to when it is reading time. You can put each child’s name on a sticky note so, if you need to make some changes, you won’t have to make a whole new chart. This is another great smart board chart idea to try. This is an interactive chart that records how long children read without stopping each day. So last, but not least, to sustain children in reading, students often need to have some options within the reading workshop, depending on their experience. Some of these may be known ways to work with partners. In that case, this chart is made at the end of a workshop where you say, “Here are some of the ways I saw you working with partners,” and then you make the chart and have children use it in subsequent workshops. If this is BRAND SPANKING NEW, you will probably teach that partners can read together and talk together first, and then add on the other two (act the story out and read like a storyteller) in the next day or so. Either way, sometimes when children seem to have limited reading stamina, it is because they need ways to keep reading or more ways to work and read together. As always, drop a comment or send a chart to chartchums@gmail.com so we can post it up. Stay safe and dry east coasters, and for our mid and west coasters, enjoy many more days of warmth and sun…and for all, enjoy the exciting first days of school preparations! Charts have never been my strong point, but I have loved seeing your examples. I am already putting it into good use for the start of school next week. Please, please keep posting examples of your charts often! 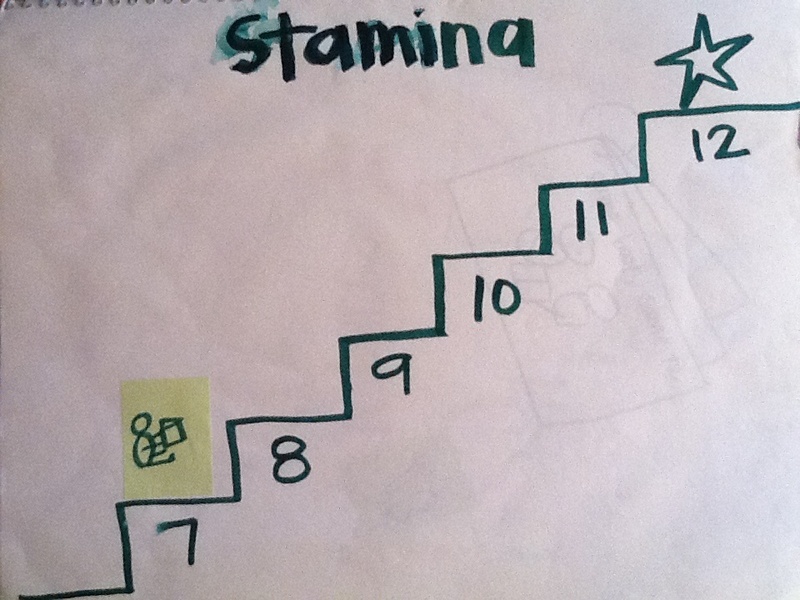 Charting is a powerful tool, not only for the teacher – but the students. 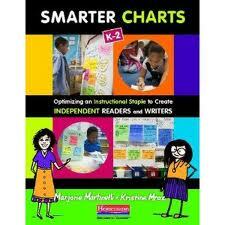 Students who learn how to chart actually form and fuel those precious dendrites! Excellent stuff!! These are great. Thank you! Glad all is well in NYC. What a great resource!Can’t wait to put them to good use! Can’t get enough of this site! Love the illustrations in the charts — they really drive the point home! Love your site!! Please add an email subscription bar so I don’t miss anything! After my first visit here I have already changed my thinking to include wayy more ideas for charting and I want to continue to learn from you! Thanks so much. Great suggestion. Consider it done! With that little info I looked around online and cannot find the books!! Help!??! What? You couldn’t kind find the great draw? Kidding! The two that we probably referenced were: Talking, Drawing, Writing by Martha Horn and the all time greatest drawing book of all time, Make a World by Ed Emberley… enjoy! I posted (on our whiteboard) step-by-step directions, placed on large sticky notes today, to assist my children as they stepped into our 15 minute interval content tables. The children, in groups, visited four tables. It was fantastic!! Charting the directions made the experience very easy to manage. Delighted. How can I submit my charts for your to look at and possibly post? Hi there! The best way is to email them to chartchums@gmail.com. We haven’t quite figured out if there is a way to upload them into comments. Thanks! Thank you thank you for all of these wonderful posts!